Jeff and Andre Shinabarger went to a gathering and asked 8 people how much money in unused Gift Cards they had with them, and they walked away with $50 in Gift Cards to help people in need. That is how Gift Card Giver was born. Every year more than $8 Billion goes unused in gift cards, and we believe there is an opportunity to match needs with these gift cards. Since inception, we have given away over $300,000 to meet specific needs and have been featured in CNN, the AJC and Relevant Magazine. How many gift cards do you have sitting in your wallet? We guess you have at least $5 of unused gift cards right now. What’s 5 bucks going to buy you? Maybe a pair of socks…but 10 people giving 5 bucks will buy a kid a winter coat. We collect and distribute cards to appropriate Non-Profits that can use those cards to help others. Note the balance on the front of the gift card with a permanent marker, and mail the card or cards to us at Plywood People: 174 Carroll Street SE. Atlanta, GA 30312. 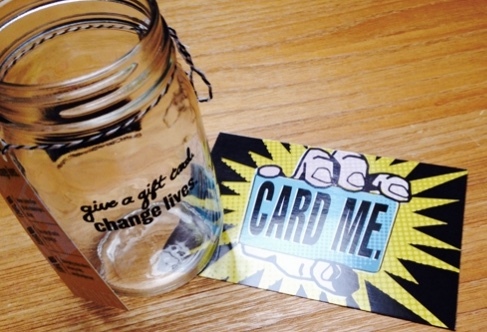 Request a jar and collect gift cards. Send a note with your name and mailing address along with $5 to cover shipping, and we will mail you a jar to use at your office, coffee shop, house party, church, etc. to collect gift cards from your community. Then, mail us the cards occasionally and we will distribute them.